The White House Communications Agency, Camp David Detachment in Thurmont Maryland has identified a number of high-level telecommunications requirements intended to provide an increased bandwidth in an intensive, redundant and robust communications system throughout the Camp David facility to provide secure and non-secure voice, data, and video service. Currently a fiber optic backbone exists throughout the Camp David facility that provides a limited but secure communications infrastructure. The Fiber Connection Project intends to build on this backbone by extending the single and multi-mode fiber connections to each building on Camp David to provide virtually unlimited bandwidth to all users. The objective of this Task Order is to provide the Government with a meticulously engineered, installed and tested fiber optic cable design solution per building at Camp David by extending the existing fiber optic backbone connectivity to designated facilities (See details in attachments: Willow Hub, Elm Hub, Box Elder Hub and Juniper Hub). Ensure that any fiber optic devices purchased & installed at all end locations are compatible with any Government Furnished Equipment (GFE) base. Provide redline drawings of the completed fiber optic project and test results to the Government. The contractor shall provide a list of detailed list of costs required to implement the proposed fiber optic cable design solution that include: hardware, labor, and life-cycle support. The contractor shall provide a comprehensive plan for installation/cutover (IAW CDRL A020) of the design solution in accordance with the approved fiber optic cable system design (IAW CDRL A005). Any changes or deviations from the approved design package shall be done in accordance with CDRL A004. The plan shall provide detailed costs for the "turn-key" solution specifically identifying all work elements and deliverables, with a breakout of specific responsibilities for all services provided. The Contractor shall provide the Government with Technical Feedback in accordance with CDRL A009 and CDRL A011. 4.1 Subtask 01 - Installation of conduit and handholds in specified locations. All conduits shall be 4" PVC schedule 80 and a minimum of 2 conduits will be installed for each location listed below. All joints shall be glued. The handholds shall be a minimum of 36" x 36" x 36", to be located off roadways, on horse trails and must bear infrequent vehicular traffic. The contractor shall submit to Naval Support Facility Public Works Division for approval a proposed route for buried conduits prior to digging. The following locations have been determined to require additional conduit/handholds to be installed to support this contract (to be validated by the contractor's site survey). - Building Walnut needs new conduit installed to building Southern Pine. (See Attachment Willow Hub page 15). - Building Mahogany needs new conduit installed from handhold 28. (See Attachment Willow Hub page 15). - Building Wye Oak requires new conduits be installed from a new handhold installed off of manhole 1 near building Spruce. 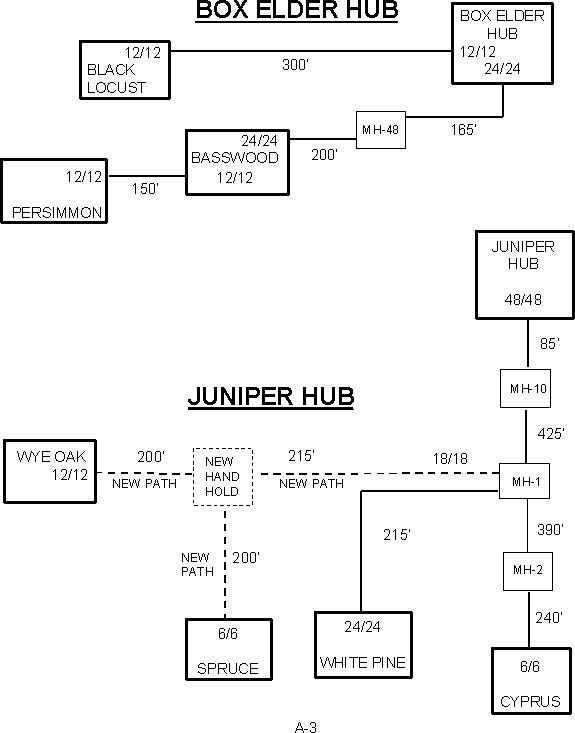 (See Attachment Juniper Hub page 16). - Building Spruce needs new conduits installed from the handhold mentioned above. 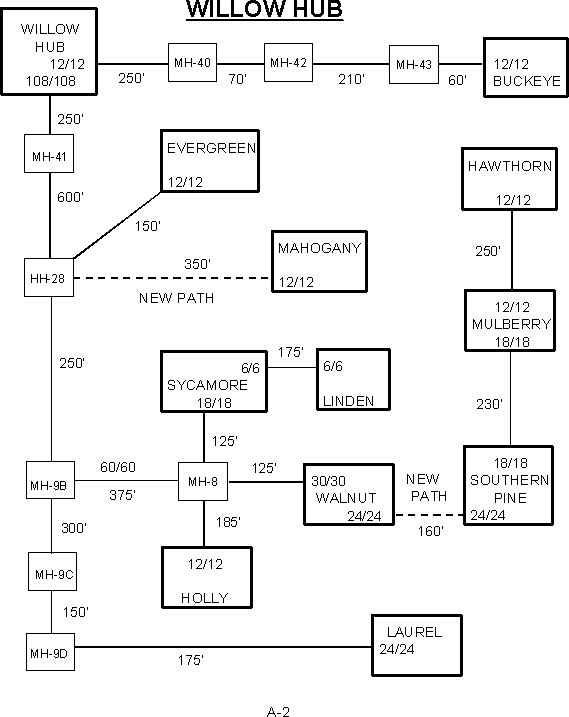 (See Attachment Juniper Hub page 16). 4.2 Subtask 02 - Install hybrid multimode/single-mode multiple fiber optic cables through existing as well as contractor provided conduit/manhole systems. This action will require installation of diminishing sized cables from the origination point down to the specific end point in order to preserve conduit space. Contractor shall utilize installation techniques that are consistent with standard industry practice to prevent kinks or radical sharp bends in the fiber cable that would create excessive link loss. Fiber optic cable shall not exceed 1 inch in diameter. 4.2.1 Willow Hub-Refer to Attachment Willow Hub page 15. 4.2.2 Elm Hub - Refer to Attachment Elm Hub page 15. 4.2.3 Box Elder Hub - Refer to Attachment Box Elder Hub page 16. 4.2.4 Juniper Hub - Refer to Attachment Juniper Hub page 16. Subtask 03 requires the Contractor to place multiple sized hybrid fiber optic cable to and/or from the above locations, splicing all fibers as necessary. The Contractor shall provide manhole splice cases. All splice cases shall be waterproof and designed for use in manholes. They may be mounted on manhole walls or hung within manholes on racking. 4.4 Subtask 04 - Install, splice, and terminate fiber optic cables equipment. a. Non-hub locations shall be wall mounted fiber light shelves that contain 12 to 48 terminations. Refer to hardware recommendations on pages 8-9.
b. Hub locations shall be rack mounted fiber light shelves that contain a total of 288 maximum terminations. Refer to hardware specifications on pages 8-9.
c. All Multimode fiber optic cable shall be terminated on ST connectors. d. All Single mode fiber optic cable shall be terminated on FC connectors. 4.5 Subtask 05 -- Test installed fiber optic cables and splices (IAW CDRL A016). Single-mode fiber will have no more than 2db/km of transmission loss. Multimode fiber will have no more than 3.5 db/km of transmission loss. All splices will have no more than .25db of loss per splice. Terminations will have no more than 1-1.5db of loss per termination. Testing will be conducted using an Optical Time Domain Reflectometer (OTDR) equipped to provide a graphic plot. All fiber terminated under this contract will be tested end-to-end and plotted. The plot will show link distance, measure overall link loss, loss at each splice, and loss at terminations. If a fault is found, the contractor shall correct the problem. 4.6 Subtask 06 - The Contractor shall provide redline drawings of the finished project as well as test results and plotting documentation (IAW CDRL A016) to the government in both hard and soft copy. The Contractor shall install the fiber optic able design solution and attest in writing to the designated Contracting Officer's Representative (COR), or the COR's representative at the installation site, that the fiber-optic cable system is integrated and ready-to-use by the Government (IAW CDRL A015). The Government will either approve or disapprove the start of the acceptance test in writing within three (3) working days. The approval will also include the start date for the acceptance test. The Contractor shall provide documentation for all hardware and services provided under this task order. The Contractor shall provide original OEM manuals when these manuals are available. All manuals and documentation shall comply with the CDRL's per DFARS 252.227-7015 "Technical Data-Commercial Items". If CDRL's and/or DID's are not specified for a particular data deliverable, the Contractor shall provide the specified data deliverable in accordance with how the Contractor would customarily provide such data to customers in the commercial marketplace. The aforementioned "commercial marketplace" data deliverables shall be made available to the Government on an "as requested" basis. Modification and expansion to the Telecommunications Infrastructure shall be conducted at the specified Hub locations at the Camp David Detachment, Navel Support Facility, Thurmont, Maryland. All work to be completed not later than six (6) months after contract award, or sooner, based on equipment availability. Normal workdays will be Monday through Friday 0730 to 1630, excluding government holidays. If the contractor desires to work outside regular hours, i.e., Saturdays, Sundays, and government holidays, a written request must be submitted to the government at least three (3) calendar days prior to work beginning so that arrangements for facility access may be coordinated with the on-site contracting officer representative (COR). There will be periods when no contractors shall be permitted access to the Camp David facility. Overnight parking for construction vehicles will not be permitted unless authorized by the on-site COR. No privately owned contractor vehicles will be permitted on the facility, unless approved by the COR. Vehicles or construction equipment will not be permitted on grassy areas for any reason. Vehicles must remain on paved areas at all times. When grassy, natural, or unpaved areas must be accessed, the areas to be traversed shall be protected by plywood or planking. Plywood or planking may be left in place for a period not to exceed 48 hours. Any area damaged by contractor shall undergo repairs by the contractor, and that area made consistent with the surrounding existing conditions by the end of that workweek. The contractor must have COR approval prior to driving vehicles or heavy-duty equipment onto grassy or natural (unpaved) areas. The contractor shall inspect all vehicles and equipment for fluid leaks prior to delivery to the station. All vehicles and equipment found to have fluid leaks will be denied access to the facility until such leaks are corrected. The contractor shall schedule work so as to minimize interference with station operations. Work schedules shall be subject to COR approval. The Camp David facility has been designated a tobacco free workplace; consequently, there are no designated smoking areas. Prohibited tobacco products apply to all forms of tobacco, to include the smokeless variety. Photographic equipment, weapons, explosives, alcoholic beverages and narcotics, are all prohibited from the facility. The making of notes, drawings, maps or graphic representations pertaining to any part of the facility are also prohibited. Violations of the above conditions will result in confiscation of such items and could potentially jeopardize the contract. Access to the Naval Support facility requires a minimum of a Secret clearance. The clearance shall be based on certification of completed Single Scope Background Investigation (SSBI), conducted by the Defense Investigative Service within the last 5 years, and the individual must be approved for Presidential Support Duty. Also, a DD Form 254, DOD Contract Security Classification Specification, must be completed. A visit request shall be provided to the COR before any site access is permitted. The visit request shall contain the minimum information specified in paragraph 37 of the Industrial Security Manual. The following information shall be furnished to the COR no later than seventy-two (72) hours or three (3) working days prior to requiring access to process gate passes. Failure to provide the prescribed information and in a timely manner may result in access denial. Generally, access to the facility on weekends will not be permitted. Must fit into a standard 19" rack and have the following dimensions to fit in designated rack spaces: 7" H x 17" W x 12" D.
Must have the following dimensions to fit into limited wall space: 9.25" H x 13.25" W x 3.25" D. Note: dimensions should not exceed those listed. Must accept 6 SM FC terminations and 6 MM ST terminations. Contractor may determine if fibers will be directly terminated or fused to prefabricated pigtails. Must have the following dimensions to fit into limited wall space: 3.5" H x 16.06" W x 4.06" D. Note: dimensions should not exceed those listed. Must accept 12 SM FC terminations and 12 MM ST terminations. Contractor may determine if fibers will be directly terminated or fused to prefabricated pigtails. Must have the following dimensions to fit into limited wall space: 13.5" H x 16.06" W x 5.125"D. Note: dimensions should not exceed those listed. Must accept 18 SM FC terminations and 18 MM ST terminations. Contractor may determine if fibers will be directly terminated or fused to prefabricated pigtails. Must have the following dimensions to fit into limited wall space: 13.5" H x 22.5" W x 4.06" D. Note: dimensions should not exceed those listed. Must accept 24 SM FC terminations and 24 MM ST terminations. Contractor may determine if fibers will be directly terminated or fused to prefabricated pigtails. Must have the following dimensions to fit into limited wall space: 13.5" H x 22.5" W x 5.125" D. Note: dimensions should not exceed those listed. Must accept 36 SM FC terminations and 36 MM ST terminations. Contractor may determine if fibers will be directly terminated or fused to prefabricated pigtails. Do to the limited space in existing conduits and manholes, the diameter of each fiber cable shall not exceed 1" in diameter. Fiber Optic cable must be rated for outdoor use, wet environments. Fiber Optic cable will not be riser rated. Note: As stated previously, the Contractor may decide to directly terminate each fiber with a connector or to splice (fusion) the fibers to prefabricated pigtails. 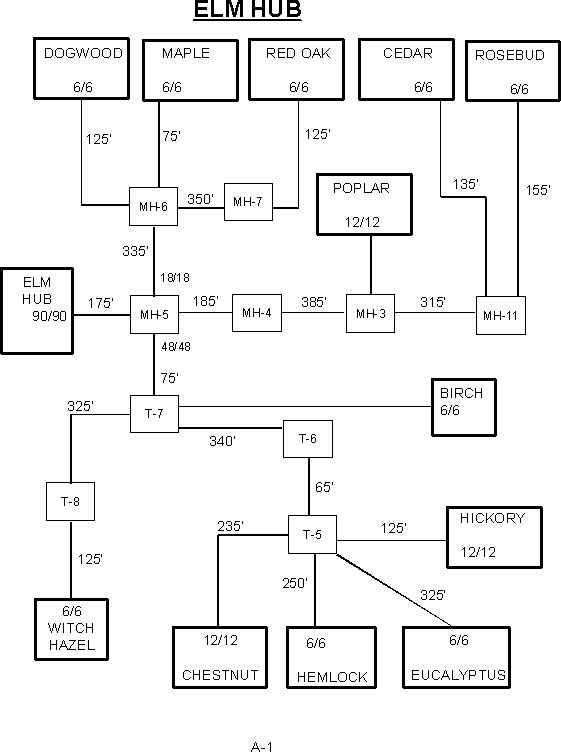 If splicing is selected, the hub locations may use separate splice housings with the maximum dimensions listed above. The splices performed in the individual buildings must be housed inside the wall mounted connection boxes due to room constraints. Notwithstanding the instructions given for proposal preparation in FAR 52.212-1 "Instructions to Offeror -- Commercial Items," the Offeror shall submit the proposal in accordance with the format and instructions described below. Any and all items in FAR 52.212-1 that are not specifically tailored or supplemented remain in full force and effect as specified in FAR 52.212-1. 10.1.1.1 The Offeror's proposal shall be prepared in two volumes in accordance with these instructions. A cover letter shall be used by the Offeror to transmit the proposal and is considered a part of the proposal. This cover letter shall also be used to transmit any information that the Offeror wishes to have brought to the attention of DITCO NCR/DISA 06 including any exceptions taken to the solicitation. 10.1.1.3 The Government intends to award for all the requirements resulting proposed CLINs and/or SCLINs in accordance with the Contractor's GSA schedule. Proposals for less than all the requirements (CLINs and/or SCLINs) solicited may be considered unacceptable. 10.1.1.4 If the Contracting Officer determines that discussions are needed, revisions to a Offeror's cost (Volume I) and technical (Volume II) proposals shall be submitted when the Offeror's final revised proposal offer is due. 10.1.2.1 The Offeror shall provide a complete and detailed overview of their pricing submission in Volume I - Cost Quotation to include any assumptions made and/or exceptions taken (e.g., type of warranty offered) as they relate to the Offeror's proposal Volume II. 10.1.2.2 Using the CLIN/SCLIN structure in accordance with their GSA schedule, the Offeror shall delineate each and every item that is in the cost quotation and offered in Volume II - Technical Proposal that would be a deliverable under any order resulting from this proposal. Each CLIN/SCLIN shall have either (a) a unit price, (b) "NC" or (c) "NSP" inserted in the appropriate place in the appropriate price exhibit. Items proposed which do not comply with all portions of the requirements may be considered for technical and cost evaluation purposes and award. The Government's cost analysis may include adjustments to the evaluation model and overall price to assess the effect of noncompliant items. This explanation shall appear in Part A of Volume II. 10.1.2.3 For each of the CLINs/SCLINs that are offered in Volume II - Technical Proposal and are subsequently included in Volume I, the Offeror shall provide detailed descriptions. Such detailed descriptions shall minimally include the following: (a) item description (including salient characteristics), (b) manufacturer and model, (c) product/model number, (d) version/revision/release/maintenance release. The description of each salient characteristic shall include a reference (in the applicable pricing column) to the applicable TRN requirement(s) and a specific reference to the site where it can be found in the technical literature submitted with Volume II - Technical Proposal. 10.1.2.4 If and when the Government calls for Final Revised Proposals, the Offeror shall submit a complete cost quotation consisting of all pages of the CLINs/SCLIns as well as any Offeror conditions, explanations and notices pertaining to its price proposal. If an alternate proposal is submitted, the Offeror shall submit price proposal (Volume I) exhibit replacement pages to the Contracting Officer at DISA 06. 10.1.3 Volume II - Technical Proposal. 10.1.3.1. The Offeror shall provide a complete and detailed presentation of the offered design / approach to the technical aspects of the SOW and evaluation criteria. The Offeror shall ensure that the content of Volume II, when combined with the descriptions in Volume I and any Offeror's "Certification of Compliance", addresses each requirement stated in the SOW. Volume II shall include a Table of Contents that is kept up to date with the other portions of the proposal. 10.1.3.2. Section A - Executive Summary. The Executive Summary shall provide an overview of the Offeror's proposal that summarizes the offer, highlighting the salient features of the technical proposal. It shall describe the approach(s) taken toward satisfying the requirements and addressing the evaluation criteria of the SOW. The Executive Summary shall be used to transmit any information that the Offeror wishes to have brought to the attention of all Government technical and/or cost evaluators. 10.1.3.3. Section C - Technical Literature Inventory. The Offeror shall provide in tabular form a complete inventory listing of all Technical Literature (TL) submitted with the proposal by unique reference number, number of copies, order number, and title. The unique reference number shall begin with the characters "TL-" followed by the number one and proceeding sequentially for all documents. Volume I shall reference these documents. Technical Literature will be considered to be a part of Volume II of the Offeror's proposal and shall be delivered in accordance with paragraph 10.1.4.2. Technical Literature is required to help substantiate the manner in which each specification is to be satisfied. a. Originate from the OEM and be addressed to DISA or the Contractor. b. Be on OEM letterhead and dated. c. Be signed by an authorized officer of the company/corporation who is responsible for satisfying the specification and has first hand knowledge of the content of the letter. The letter shall state the same. Authority may be delegated, but a certification letter must be provided which adheres to these instructions and identifies why such delegation is being made, to whom it is being given, and to what extent it is valid. In any event, letters from salesmen and marketing individuals shall not be accepted. d. Use the word "certify." e. Indicate when the proposed item will be available as described. f. Indicate whether the proposed item will include modifications and/or enhancements not currently reflected in the provided documentation or data; if so, indicate: (1) whether those modifications or enhancements will be incorporated into the technical documentation at a later date, and (2) the date the final version of the documentation or data will be available. 10.1.4.1. DISA Skyline 5 (DITCO NCR) Delivery. One (1) original and one (1) copy of Volume I as well as one (1) original copy of Volume II shall be submitted to following with a transmittal letter. 10.1.4.2. DISA NS-8 Delivery. Three (3) copies of Volume II shall be submitted to the following address with a copy of the transmittal letter. 10.1.5. Amendments to the Proposal. Changes by the Offeror to the proposal shall be accomplished by submitting amended pages to the Contracting Officer named in 10.1.4.1 at DISA Skyline 5 in accordance with10.1.4.1 above. Changes to the original page shall be indicated either a right or a left marginal vertical line placed adjacent to the change. The Offeror shall include the date of the amendment on the bottom right of each page. Each amendment to the proposal shall include a dated cover letter signed by the official of the firm transmitting the specific changes made by the amendment. Offeror's shall update proposals throughout the negotiation process to reflect Offeror responses to Government clarification requests, deficiency reports, changes to proposed items, etc. Regardless of the number of proposal updates submitted, the integrity and clarity of each proposal must be maintained. The evaluation criteria for past performance, project management and support as well as overall technical features, capabilities and techniques are found in Attachment 1 [not included here; see source Zip file]. Question 1: Please address why all offerors cannot have 30 days to respond to this solicitation. Our company, MFN GS is a small business that has a rich history in providing this type of service to industry. This solicitation was just announced today. We believe the government will need full and open competition and only 14 calendar days has been alloted to respond. (3 of those days are over a Federal Holiday). If possible, we would like and extension of an additional 14 days. Gov't Response: This question was received on 23 Aug 02. The due date has been extended from 5 Sep 02 to 12 Sep 02 and cannot be extended any later due to the need to evaluate offers and make an award by 30 Sep 02. Question 2: Must the offeror have a GSA Schedule as listed in 10.1.1.3? Ref: "The Government intends to award for all the requirements resulting proposed CLINs and/or SCLINs in accordance with the Contractor's GSA schedule." Gov't Response: No, the offeror does not have to have a GSA schedule - this is a notice to offerors that the Government's most reasonable cost will not be greater than any price found in existing GSA schedules with the proposed products on them. Question 3: No excel spreadsheet was in the downloaded files as described in Evaluation Criteria SUBFACTOR B: COST/PRICE PROPOSAL "The offeror is required to submit all pricing data in the format indicated in SOW paragraph(s) 10.1.2 through 10.1.2.4 and directions found in the excel spreadsheet." Can you address/provide clarification. Question 4: Can we use other existing DISA contract vehicles to respond to this solicitation? Gov't Response: Yes, you may use any existing contract vehicle. Question 5: There is a missing segment distance between the Birch building and T-7. What is that distance? Gov't Response: The distance is 175 feet. Question 6: What is the distance from MH-3 to Poplar? Gov't Response: The distance is 225 feet. Question 7: What is the distance from T-7 to Birch? Question 8: When may I schedule a site visit and with whom? Gov't Response: There will be no pre-award site surveys. Question 9: Do I need a current SECRET clearance to make a site survey? Gov't Response: Yes, a post award site survey would require a secret clearance. Question 10: I have a SECRET clearance dated on 920909 while in the US Army. I was discharged from active duty on 960729 with an Honorable Discharge. Is this clearance still good? If not, where may I update this clearance? Gov't Response: The clearance will need to be re-done because it is outdated, please refer to Industrial Security Manual for guidance. Question 11: Must the offeror have a GSA Schedule as listed in 10.1.1.3? "The Government intends to award for all the requirements resulting proposed CLINs and/or SCLINs in accordance with the Contractor's GSA schedule." Gov't Response: See Response to Question #2. Question 12: No excel spreadsheet was in the downloaded files as described in Evaluation Criteria SUBFACTOR B: COST/PRICE PROPOSAL "The offeror is required to submit all pricing data in the format indicated in SOW paragraph(s) 10.1.2 through 10.1.2.4 and directions found in the excel spreadsheet." Can you address/provide clarification. Gov't Response: See Response to Question #3. Question 13: Can we use other existing DISA contract vehicles to respond to this solicitation? Gov't Response: See Response to Question #4. Question 14: In the SOW, can you provide the vendor/manufacturer of the listed equipment below. Many of these items could cost hundreds or thousands of dollars. It is necessary to get the brand name for fair pricing. Must accept 6 SM FC terminations and 6 MM ST terminations. Contractor may determine if fibers will be directly terminated or fused to prefabricated pigtails. Must accept 12 SM FC terminations and 12 MM ST terminations. Must accept 18 SM FC terminations and 18 MM ST terminations. Must accept 24 SM FC terminations and 24 MM ST terminations. Must accept 36 SM FC terminations and 36 MM ST terminations. Gov't Response: Paragraph 9 was listed as an example and to provide critical dimensions for several items that must be installed in confined spaces. None of the item individually will cost hundreds of thousands of dollars. Question 15: Paragraph 9.0 of the SOW references Corning parts; do you prefer that we quote Corning parts, or will you consider another manufacturer's comparable parts, such as Panduit? Govt Response: That is what the Government is most familiar with; however, the primary factor is quality of parts, i.e., if panduit makes a comparable part and it meets or exceeds Corning parts specifications great. Question 16: The SOW references CLINs and SCLINs, but none are included in the package available through Fedbizopps; nor is a Section B or pricing sheet included. How do you want us to price this? Also, the SOW references that the "CLINs and SCLINs" should be priced "in accordance with the Contractor's GSA schedule." Do you require that all materials and services be available under, and priced IAW, the Contractor's GSA schedule? Govt Response (a): See the response to Question #3. Govt Reponse (b): See Response to Question #2. Question 17: Do you still intend to award to a Small Business if you receive two or more offers from a Small Business as stated in your Presolicitation Notice? Gov't Response: Yes, in accordance with the Synopsis/Solicitation that was issued in accordance with FAR Part 12.6. Question 18: What is the difference in NCA and SSBI Secret Clearances? Govt Response: NCA is National Agency Check versus an SBI, which is a Source Background Investigation. Both of these are listed in the current Industrial Security Manual which vendors have. Question 19: How does this affect offerors? Govt Response: A NAC is not acceptable. Final SECRET based on SSBI is required. Question 20: Do you need the clearances prior to your submission of an offer? Govt Response: The clearance is required to start work. Including post award site surveys.